Informative Information on Mortgages, Lifestyle & Home Ownership. Loan City Home Loan has home improvement ideas and tips to increase the value of your home in an inexpensive way. Yes, value of your home can be increased by some simple home improvement strategies and without having to find yourself cash poor. Whether you are looking to improve its appearance or prepare it for sale, we have some useful tips for making it happen. Bear in mind that the actual cost and return on investment can vary for each individual home improvement project, based on the condition of your home and the real estate market values of your particular area. One of the first places prospective buyers will race to see is the kitchen. As the heart of the home, the kitchen needs to appear neat and have an average number of modern appliances. Investing in upgrades that will cost only a few hundred dollars, such as the kitchen faucet, cabinet door handles, and energy efficient lighting, can make the difference between a sale and no sale. For additional dollars, a makeover of the entire set of kitchen cabinets will impress. There are a number of companies that will remove and replace the cabinet doors and drawers, refinish the insides and outsides, and the result will look almost brand new. If you are a do-it-yourselfer, the cabinet doors and door fronts from major home improvement centers such as Lowes or Home Depot. At yet another level, the entire cabinet set can be replaced, though this is probably beyond what most potential sellers will want to invest in. Replacing old standard kitchen appliances that are outdated or do not appear to be matching is an easy way to make a difference. You may not need to purchase new appliances if there are replacement front panels available. Appliances are a visible part of the kitchen, so make sure that both are looking their best. This is another room that can be made to look much better with not a lot of cash outlay. Replacing the toilet seat and updating sink fixtures are simple and will make the room shine. Look at the floor to see where tiling needs to be replaced. Some vinyl flooring can be installed over the existing floor without the need for tearing up the old. The tub and shower are important parts of the bathroom’s appearance, and dingy wall tiles or tub can be cleaned and re-grouted. There are prefabricated shower wall units that can easily cover up badly damaged walls. Installation may require a professional contractor, but the return on investment can be high. More often than not, the older the house the less closet space will be available. The economical answer is to install do-it-yourself closet systems in the bedrooms, entry closets, and pantries. Closetmaid is one example of an Internet site that allows you to redesign your closets online. Large home improvement retail stores will also have tools to help you with these projects, which often do not take more than a weekend. The selling point of improved closet is functionality. Improving the closet space now will make your home easier to live in and for the prospective home buyer it will show an effort as been made to customize the home. For around $1600, your current den can be converted into a bedroom with the addition of a closet. With that investment, it changes a three-bedroom house into a four bedroom, making a significant difference in the sale price of the house. A custom drywall and closet kit can be bought to do the job. 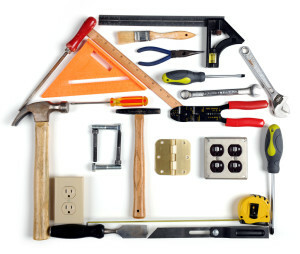 Two systems that are critical in a home are the electrical and plumbing. It is a worthwhile investment to hire a plumber and electrician to give the home a once over, looking for faulty electrical wiring or leaks in the pipes. Potential buyers will notice the care taken to maintain these basic yet vital systems. Carpeting and floor coverings are what people can both see and feel. If the carpeting is worn or bare, the potential buyer will take immediate notice. Carpet cleaning is a first step and cleaners can be rented as needed. As a temporary fix, area rugs can be used to cover worn spots. Depending on the buyer, there are those who plan to install their own choice of wall-to-wall carpeting, but do not lose sight of the purpose – to improve the look of each room. Low lighting and recessed lighting are two issues that can be changed inexpensively and quickly. A chandelier is a noticeable feature in a dining room, and a slightly higher wattage, energy efficient bulb can light up a room to avoid a gloomy appearance. Many options are available at home improvement stores, including a ceiling fan–light unit. In addition to keeping the house cooler, it adds light to the area. Existing ceiling fans can have their blades replaced to update its appearance. The main door to the house should have a large, sturdy handle and doorknob to highlight to visitors that they are entering a solid home. While basic steel front doors are common, you can repaint or design a faux finish to make it more attractive. A little paint or stain to existing garage doors can dramatically improve the eye appeal. An initial coat of primer followed by a coat of paint specifically produced for metal objects is a quick, inexpensive way to get the job done. After these base coats dry, applying your choice of stain can turn the ordinary into the amazing, and should only take a few hours. The first glance prospective home buyers will notice, whether walking to the house or driving by, is the cleanliness and neatness of the outside environment. Sweeping the driveway and sidewalk, and manicuring the lawn will speak loudly about the care the owner has given to the home. If gardening is not one of your better skills, consider hiring a professional landscaper to plant a few shrubs, install sod where needed, and generally clean up the front yard. Not only will the neighbors appreciate the effort, but the overall perception of the house will increase the overall value of the house. Each of our top 10 home improvement tips are affordable and if followed will definitely add value to your home.